Oroclines are secondary bends or buckles of an originally more linear orogen. They have been documented on all continents and affecting Archean to present day orogenic belts. In order to understand the tectonic and paleogeographic significance of a buckled orogen, it is necessary to first palinspastically restore the oroclines affecting the orogen. There remains, however, a lack of consensus regarding the processes responsible for orocline formation, and hence over their paleogeographic significance. Ongoing debates concern: (1) the three dimensional geometry of oroclines (are they thin-skinned, ending down against mid-crustal detachments, or do they involve the entire lithosphere? ); (2) how orocline formation is accommodated in adjacent lithosphere; and, (3) if oroclines form in response to orogen-normal stresses imposed by either rollback or indentation, or if they represent buckles attributable to orogen-parallel compression. 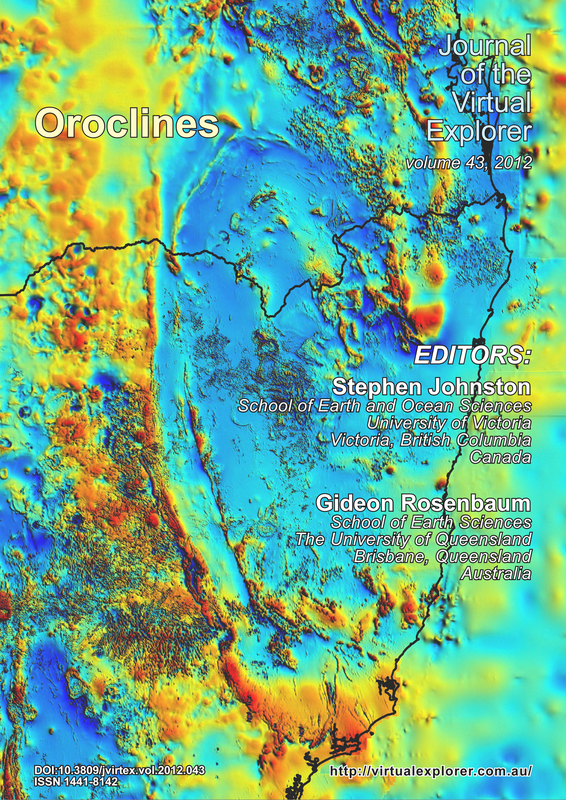 Contributions to this special issue on oroclines include comprehensive geological and geophysical studies of bent orogens from Australia, South American and Europe, all aimed at resolving the tectonic and paleogeographic questions posed by oroclines. Cover Image: A map showing the total magnetic intensity across the southern New England Orogen (after Milligan et al., 2010) of eastern Australia nicely images the oroclines that characterize the orogen. The convex to the north bend imaged immediately east of the north arrow constitutes the Texas orocline, which is continuous with and coupled to the convex to the south Coffs Harbour orocline farther to the east. To the south, the orogen describes two additional oroclines including the convex to the south Manning orocline in the west, and the more easterly (and less obvious) Hastings-Nambucca orocline. See papers by Glen & Roberts and Rosenbaum in this issue. Influence of Inversion Tectonics in the Bending of a Foreland Fold-and-Thrust Belt: The Case of the Northern Apennines (Italy).